Low Mileage, Sunroof, Uconnect, 8.4 inch Screen, 18-inch Satin Silver Aluminum Wheels! Compare at $18396 - Our Price is just $17688! According to Car and Driver, the Chrysler 200 offers a competent chassis, an intuitive infotainment system, and plenty of storage. This 2016 Chrysler 200 is for sale today in Coquitlam. The Chrysler 200 is a prodigy of style and agility, increasing its driver's freedom to travel confidently. This is where the everyday commuter meets weekend getaway for the perfect balance of premium design, power, fuel efficiency and driving dynamics. The sleek exterior offers an athletic stance with a lively engine that's both responsive and efficient. 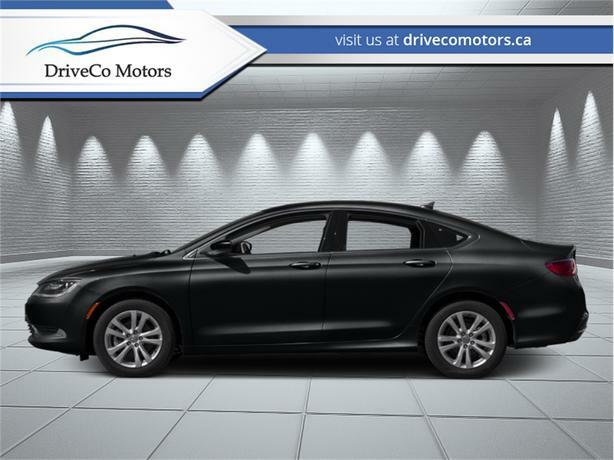 Get a superior driving experience and an exceptional value with this Chrysler 200. This low mileage sedan has just 20160 kms. It's phantom black tri-coat pearl in colour. It has a 9 speed auto transmission and is powered by a 295HP 3.6L V6 Cylinder Engine. This vehicle has been upgraded with the following features: Sunroof, Uconnect, 8.4 Inch Screen, 18-inch Satin Silver Aluminum Wheels. It has some remaining factory warranty for added peace of mind. Our 200's trim level is Limited. Enjoy more style and technology in the 2016 Chrysler 200 Limited with feature that includes aluminum wheels, an 8 way power driver seat, leather steering wheel, bluetooth connectivity and an upgraded 6 speaker audio system over the base LX model. This stylish car also comes with premium cloth seats, Uconnect technology and a 5 inch touchscreen. To view the original window sticker for this vehicle view this http://www.chrysler.com/hostd/windowsticker/getWindowStickerPdf.do?vin=1C3CCCAG3GN183347. Buy this vehicle now for the lowest bi-weekly payment of $115.24 with $0 down for 84 months @ 4.99% APR O.A.C. ( Plus applicable taxes - Plus applicable fees ). See dealer for details.